Forklifts trucks are the workhorse of the modern warehouse. They have become a vital tool for moving goods in, through and out of the facility. Adding computing, data collection and communication capabilities can improve workflows and transform forklifts from materials handling equipment (MHE) to intelligent, integrated vehicles where operators perform as many of their tasks as possible from the cab. That’s why we offer the richest ecosystem of solutions and accessories in the industry whether your environment is manufacturing and production, contract logistics, retail distribution or e-commerce fulfilment. Our hub page explains what you need to consider when choosing the right accessories for your materials handling equipment. How to put desktop applications at the fingertips of your MHE operators with the help of vehicle-mounted, rugged mobile computers and tablets. 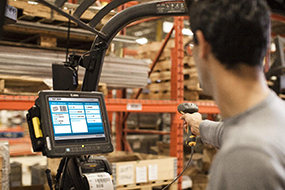 How rugged scanners can enable MHE drivers to scan multiple barcodes accurately from up to 20 metres, without leaving the vehicle. How mobile printers can enable MHE drivers to easily print barcodes at the point-of-use, saving valuable time and optimising efficiency.